MongoDB is popular NoSQL database that is used for storing the data in the form JSON like objects and it is widely used because of excellent performance, high availability, and easy scalability. The key difference between the SQL(Relational Databases) and NoSQL(Non-Relational Databases) is that the data is stored as tabular format rows and columns in Relational Database while the data is stored in the form of a document file. The examples of SQL database includes MySQL, MSSQL, Oracle DB, PostgreSQL whereas the examples of NoSQL are Amazon DynamicDB and MongoDB, Couchbase etc,. The other differences are, the SQL follows strict schema whereas NoSQL doesn't follow the strict schema etc,. You don't need any prior knowledge to get started with MongoDB. Having knowledge of SQL makes your job very easy for learning MongoDB because the concepts are almost similar to the SQL only thing you need to learn syntax. Prior experience with NodeJS/PHP helps you to develop the web applications in the real-time. There are many resources to learn MongoDB but below are best video tutorials to master in MongoDB. 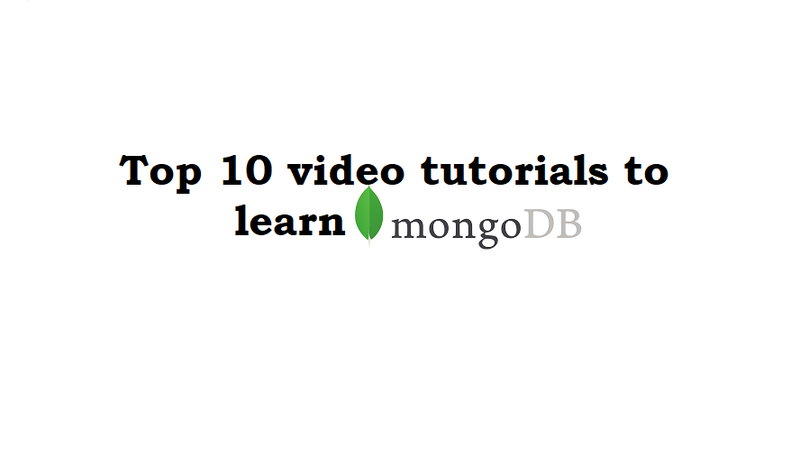 This video tutorial is a popular tutorial to learn and understand MongoDB. The instructor provides in-depth explanations and great examples reducing the over complexity and he also uses a lot of really helpful diagrams to make his students understand the concepts clearly. In this tutorial, the instructor explains how to insert, manipulate, data validation and also covers the advanced query techniques. The instructor walks you through MongoDB in Node JS environment. The best part of this video tutorial is real-time projects. Each project helps you to understand and learn new concepts in MongoDB in a professional way. 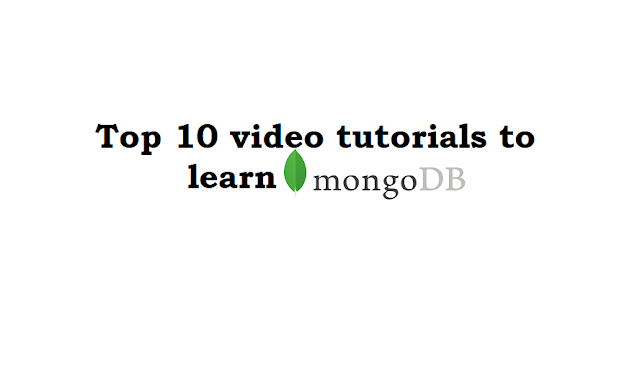 This video tutorial is best suitable for anyone who wants to master in MongoDB. This is a great place to get started with MongoDB and in this tutorial, the instructor starts the video tutorial by explaining the basic concepts of MongoDB, how to install MongoDB on different operating systems, how to create databases, Collections, how to manipulate the data by performing CRUD operations and Indexing. data modeling, relationships, how to manage the user/roles, how to use the regular expressions. Then the instructor walks you two real-time projects. In the first project, the instructor shows how to work with node.js and MongoDB and in the second project, the instructor shows User Management System using MongoDB and Java/JEE. The tutorial is best suitable for the beginners and who wants to learn MongoDB. This is the best video tutorial for Beginner and the instructor covers all the topics properly with detailed explanation. The instructor makes sure that there is a proper balance between theory and practice and nice focus on important details. The instructor uses different environments such as PHP, Node JS etc instead of just sticking to one web technology. I highly recommend it to anyone interested in learning MongoDB. GeekLogger Sails.js App. These projects give you confidence that you can build projects on your own. I recommend this tutorial for those who are already familiar with different web technologies. This video tutorial helps you to learn how to get started with MongoDB up and running, manipulate and query data, the index for speed, and also help you with the required skills to start using Mongo. This tutorial is best suitable for the beginners. This video tutorial is presented Lynda and here, the instructor shares all her knowledge in MongoDB. The instructor starts with explaining the differences between the Relational DBMS and NoSQL. Then explains the concepts of MongoDB in Node JS environment. This video tutorial is best suitable for the beginners. This video tutorial is presented by programming knowledge channel and in this tutorial, the instructor all the required in MongoDB. You'll find the answer to the questions such as what is MongoDB? why and where you should use it? how to set up the MongoDB Environment, creating a collection, document etc,. In this video tutorial, the instructor covers the topics such as Basics of MongoDB, NodeJS with MongoDB, PHP with MongoDB. The instructor starts explaining installing, how to setup the environment, create and drop Database and collections, how to insert the documents, collections, conditions etc,. It is worth to go through the tutorial. In this video tutorial, the instructor teaches you all of the basics of MongoDB, including how to install and connect to MongoDB on your local computer as well as create, read, update and delete data and also you will learn about Mocha testing.